Since the 17th century, stories about the Flying Dutchman have been popular worldwide. The legendary ghost ship never made it to land. It was doomed to sail the seas forever. So, in the crypto world, is Dutch Coin have a similarly doomed fate? Does this project have the ability to thrive? In this article, we’ll look at factors such as tech specs, use cases, and trends in the Dutch Coin price to better answer these questions. What Is Dutch Coin (DUTCH)? Dutch Coin (DUTCH) is a cryptocurrency that is intended for use in the Netherlands. For example, on the project website, goals include “gathering as many as possible Dutch webshops to get connected”. The project also has aspirations to gain user adoption internationally. It utilizes a hybrid Proof-of-Work, Proof-of-Stake consensus algorithm. Similar to Litecoin, Dutch Coin uses the Scrypt hashing algorithm. According to the project website, “Dutch coin is an altcoin made by a dutch friends. We hope to become the biggest dutch altcoin ever made.” Yes, there are a lot of strange grammar errors like this throughout the project website. From this, it isn’t clear if Dutch Coin plans to focus on use cases beyond the borders of the Netherlands. While we have seen quite a few different cryptocurrencies for use in specific nations, these have been widely controversial for the most part. Projects like the Petro in Venezuela and Turcoin in Turkey provide good examples. Estonia’s Estcoin was quite possibly the most promising national cryptocurrency project proposal. However, the Estonian government scaled back its plans in June 2018. Dutch Coin aims to bring crypto to the Netherlands. When it comes to fundraising, it’s unclear whether or not this project actually conducted an ICO. No information regarding fundraising efforts is listed on the project’s Twitter page or website. It’s also unclear what the market cap of Dutch Coin actually is. For example, on sites like CoinMarketCap, this amount isn’t listed. However, we can see that Dutch Coin is still trading. Looking at the project website, not many technical details are listed. In addition, there isn’t a whitepaper or links to popular social media platforms besides Twitter. There are a few basic details like the maximum DUTCH supply (440 million) and block reward (50 coins). In addition, 83.6 million DUTCH were pre-mined, approximately 19% of the maximum supply. The project received a few compliments on Bitcoin Garden Forum for its decision to utilize Proof-of-Stake and Proof-of-Work. However, some complained that the reward was not enough to incentive mining participation. Dutch Coin conducted a pre-mine and features a hyprid PoW/PoS conensus algorithm. Yes, the Dutch Coin price is down like almost every other crypto across the board. We should expect this in a bear market. However, Dutch Coin values are down considerably more than most other cryptos. For example, the current Dutch Coin price suffered a 59.6% in the last 60 days (July 28 to September 28). As a comparison, Bitcoin is only down 20.6% during the same timeframe. Meanwhile, XRP is actually up 18.8%. According to CoinMarketCap, Dutch Coin’s market cap is unknown. No team is listed on the project website. It’s also difficult to tell what phase this project is currently in. This is because goals are listed in three stages: early stages, second stage, and final stage. No dates are given for these stages, so it’s impossible to know exactly when we can expect various steps to begin or end. Compared to most blockchain projects, Dutch Coin is significantly lacking in its focus on technical feature updates, especially in the latter two stages of its roadmap. For example, the main technical update mentioned beyond the early stage section is “connecting both miningpills en blockexplorers”. For the most part, the roadmap is marketing-focused with goals like “starting with the social media awareness thru a social Airdrop” and “starting with small local marketing”. Yes, it’s important to focus on marketing efforts, but one would expect there to be more goals than what’s available on the current list. It would also be beneficial to see more detailed, time-specific plans. This could help Dutch Coin build its community of crypto advocates and establish its adoption throughout the Netherlands as well as other nations throughout the world. Additionally, the last update from the project’s Twitter page was way back in December 2017. 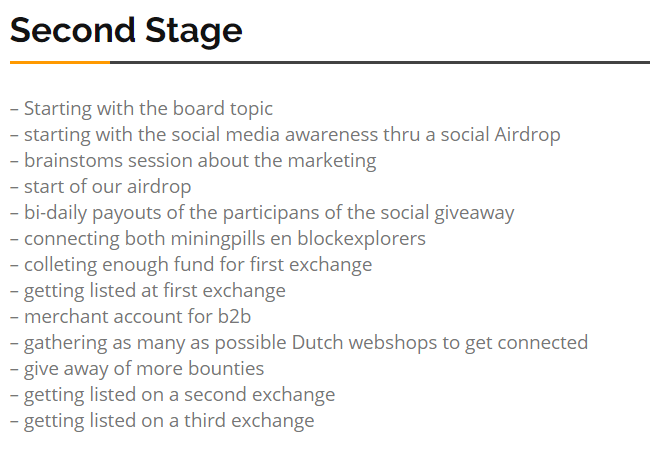 Dutch Coin mainly lists marketing efforts in the second stage of its project roadmap. According to CoinGecko, Coinexchange is the only cryptocurrency exchange to sell Dutch Coin. It also only has one trading pair: DUTCH/BTC. The project team submitted Dutch Coin to Yobit in December 2017, but it has not been successful at getting listed on that exchange or any other major exchanges. 24-hour trade volume is extremely low. For example, on September 28, this mark was at $2.41 according to CoinGecko. This isn’t just due to a bear market. For example, there have been several days where this mark was below $10. In January 2018, the highest 24-hour trade volume amount was only at $11,500. As mentioned above, Dutch Coin values have also been continuously decreasing throughout 2018 as well. On the project’s Bitcoin Garden Forum page, one user asked if the project was still alive in May 2017. As of October 1, 2018, that user still hasn’t received an answer. Therefore, the project can probably be deemed dead at this point. It’s possible that it could be revived; however, a lot of improvements would need to be made. The idea of a nationally-focused cryptocurrency or even a regionally-focused cryptocurrency is not a new idea. These projects seem like good concepts in theory. However, in practice, we see many barriers to adoption, even in cases where the project is backed by a national government. In the case of Dutch Coin, we don’t see any such support from national or even local governments in the Netherlands. This makes it even more difficult to gain mass adoption. Other factors like the lack of trading volume and lack of exchange availability have likely led to the large decrease of Dutch Coin values compared to other cryptocurrencies in 2018. Is Dutch Coin doomed to become a Flying Dutchman? According to the updates (or lack thereof) in 2018, the answer appears to be yes.